Lady Skywriter: Helen Jacobson Richardson Loved Northwest Airlines! Lady Skywriter: Helen Jacobson Richardson Loved Northwest Airlines! Helen Jacobson Richardson Loved Northwest Airlines! Among many artifacts Richardson donated to the Minnesota Historical Society is the "gum caddy" that Helen used to pass gum to passengers to alleviate pressure-popping in their ears. Helen Jacobson Richardson died January 6 at Friendship Village in Bloomington Minn. She was 99 years old. She was the third stewardess hired by Northwest Airlines in 1939. All registered nurses, the first two, in order, were Dorothy Stumph and Virginia Johnson. Helen brought additional experience to Northwest, having already flown for United Airlines for a year, and surviving an airplane crash in the process. After Helen's memorial service at Fort Snelling Chapel, friends and family gathered at the Officer's club. It was nice to meet Helen' kids and peruse a table of mementos. I became distracted by the sight of two uniformed Northwest and Delta flight attendants in attendance and I raced over to them to ask the obvious . . . how did you know Helen? Wayne and Jerry serve on the NWA History Centre Board. It seems Helen was a passenger on a flight of Denise's in 2006. She sat in an aisle seat and they talked from time-to-time. Helen shared the story of her early flying days with Denise, and when she deplaned Denise said, "Helen pressed a piece of paper in my hand with her phone number on it." She said, "I'd like to continue this conversation." And they did. Denise called her sister Marsha, also a NWA flight attendant, and they visited back and forth with Helen. Then one day Denise was asked to work a demonstration flight on an A-380 that Airbus was bringing in to MSP, hoping Northwest would buy for their fleet. Denise got the idea to invite Helen to come along to see this huge new aircraft. She went to her boss at the airline, telling Helen's story, and a ticket for Helen was obtained. Although Helen declined to go on the flight, she had a great time visiting the airport, meeting then-NWA President Doug Steenland and various other dignitaries, and enjoyed sharing the limelight. Marsha Martin retired from NWA just before the Delta merger, and Denise is still flying. They came to Helen's service to pay tribute to a special friend. Remember that table of mementos I mentioned earlier? 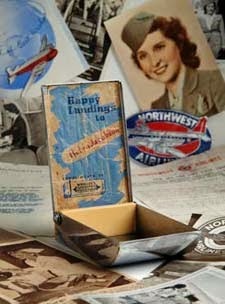 On it I saw a newspaper clipping about a flight Helen worked for United in January, 1939, before she joined Northwest. The clipping referred to the first radio broadcast from an airplane. WCCO and "Howie Wing" were mentioned. This clipping has opened up a whole new world for Lady Skywriter. Stay tuned for news on this in a future blog. Although she has left us, Helen continues to bless us.